Premier Li Keqiang called on Monday for further efforts to drive agricultural modernization and manufacturing upgrades amid China's economic transformation. 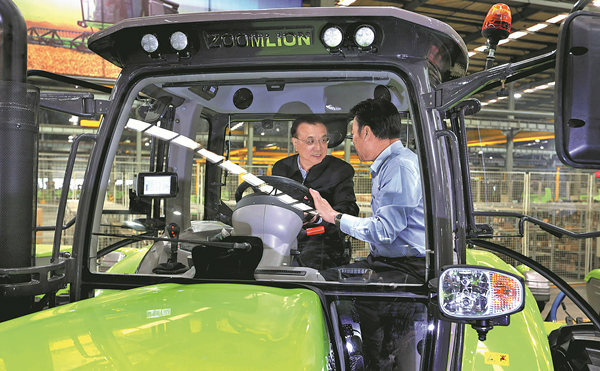 Li, during his inspection tour in Central China's Henan province, visited an agricultural machinery manufacturing plant in Kaifeng and climbed aboard on a newly made tractor developed using domestic technology. Li also visited people living in a floodplain. The tractor company recently designed and began making the farm tractor, which is powered by a 230-horsepower engine — a product that used to be dependent on overseas technology. Wang Hongmei, the company's office director, said the tractors are eagerly awaited in Northeast China as well as the Xinjiang Uygur autonomous region, where large-scale farming and deep plowing are common. Li, boarding the tractor and learning in detail about its operation from Wang Jinfu, deputy director of Zoomlion, stressed that such technology upgrades should be more widely applied to agriculture modernization. With almost all control panels inside the operator's cab, Wang explained that the tractor can be controlled with only one hand. On Monday, Li paid visits to several households in Lizhuang township along the Yellow River floodplain area, where in villages scattered in low-lying areas suffer frequent flooding. Li urged the relocation of these villages. The township has 18 villages undergoing such conditions.